The canvas “Ivan the Terrible and his son Ivan November 16, 1581” is one of the most illustrious works of the great Russian artist Ilya Repin. The idea for writing the canvas came from the artist after the concert of Rimsky-Korsakov, in addition, suggest that the reason for writing it was the murder of Tsar Alexander II and repression. This picture was not only a completely unexpected, innovative image of Ivan the Terrible, but also the most famous work of Ilya Repin. The work amazes, scares and fascinates the viewer with its bright expressiveness and plot. Everything in it is eloquent and adds tension: the tones of the painting are either screaming blood-red, or dark and gloomy; the murder weapon is a sharp-tipped wand stained with blood; the chair had fallen, the carpet had gone astray, and in the middle was a distraught old man with his dead son on his lap. And yet, the whole extraordinaryness of the picture lies in these two figures. A second clouding of reason forced his father to death with a rod to strike his own son’s temple. Immediately realizing what happened, the old man rushes to his beloved heir, panickedly trying to squeeze the bloody wound with his hand, presses to himself and kisses his son on the forehead, looking into the distance with eyes full of horror and despair. He already understood what had happened terrible and irreparable… One can only be amazed at how accurately Repin was able to portray the whole range of emotions and experiences that invaded the killer at that moment. The sacrifice in the picture, the son of Ivan, causes compassion and pity in the viewer: his face expresses calm doom, and the pose – a complete lack of vitality. 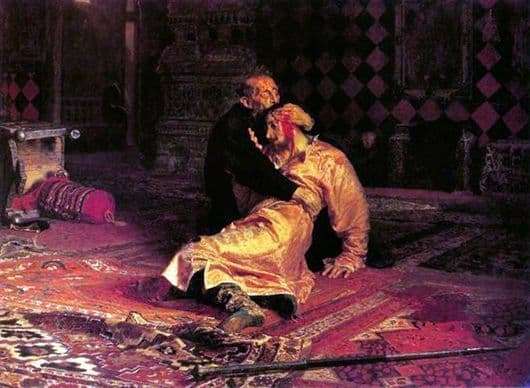 The painting “Ivan the Terrible and his son Ivan on November 16, 1581” depicted not just the killing of his son by the king, but a tragedy reminiscent of the recent massacre of the People. Vivid images produced and produce the proper effect on any viewer, not leaving anyone indifferent.